Online shopping has become a more convenient option for many who are looking for a better convenience of buying the things that they want and need. This is the reason why many eCommerce sites continue to be a thriving business online. The quality of the web design of an eCommerce site contributes a lot for improving sales and giving an impressive impression to online shoppers. With the advent of computer technology, online shopping has become a byword to households and everyone who holds an iPhone, Android phone, a laptop and a personal computer. This makes it important to have a responsive web design for an eCommerce site in order to cater to the diverse ways on how online consumers shop online using different mobile platforms these days. 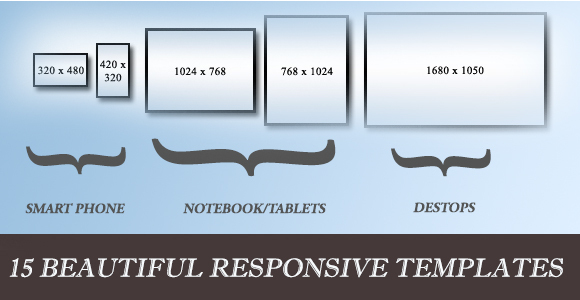 Here are some of the responsive web designs that you can find online that boost the sales of an eCommerce site. A first ever beauty associated template Beauty Center is setting the trend for a more exciting website. A more responsive layout was created to enhance the appearance especially in mobiles and other gadgets. It comes with a minimalist design with simple colors and custom web fonts. 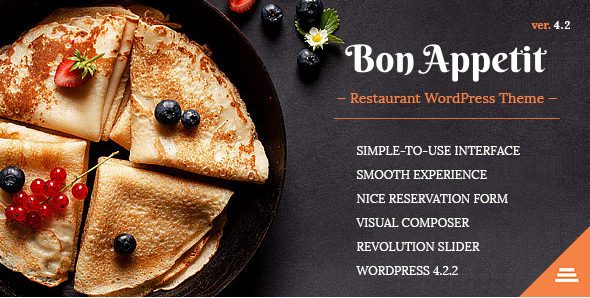 Bon Appetit template has been given the finest design specifically for a coffee shop or a restaurant website, yet it can conveniently be personalized for catering or any other specialized recipe site. It is a premium responsive design that comes with 2 backgrounds along with a Photoshop styling guide to customize colors, images and fonts. 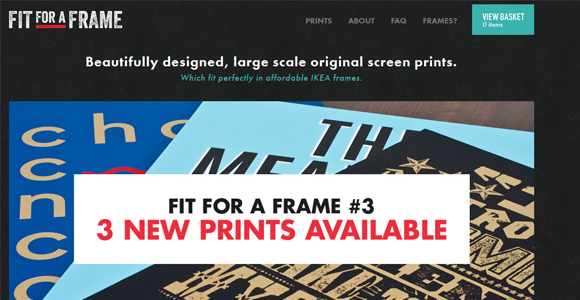 The website offers awesome prints produced by creative designers and skilled illustrators. The online store was gorgeously presented in a simple layout and navigation, which was actually compressed to cater to smaller screens such as mobile phones. The homepage displays some interesting tricks when explored by the viewer. Specifically and uniquely designed for Gym websites, Gym Extream is an HTML template, which can be modified easily, always ready to be up and running around the box. It comes with a dropdown menu and is optimized by jQuery. You can easily edit the template using source codes. 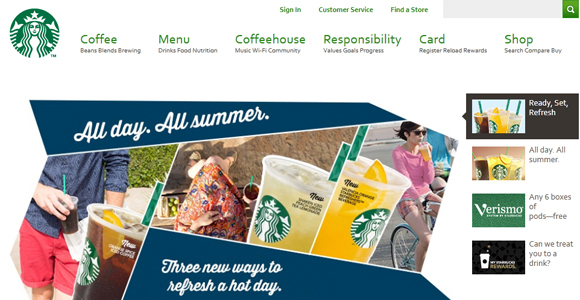 Starbucks had finally developed a responsive website. The site successfully visualized a coffee shop that has all the modern features presented on the home page. It is beautifully crafted especially when viewing on a mobile, and each icon is doing its job perfectly. The site appears interesting in its entirety, and all items were properly consolidated into one complete responsive menu icon, which is easier to manage. 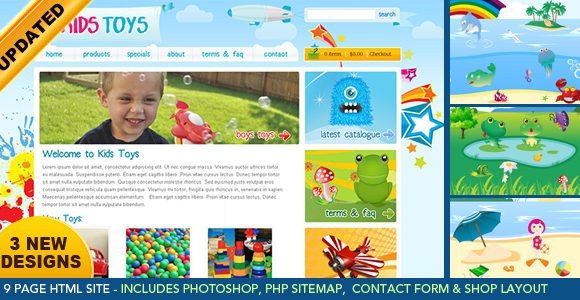 The website was uniquely created to highlight products as well as activities that are available for children. 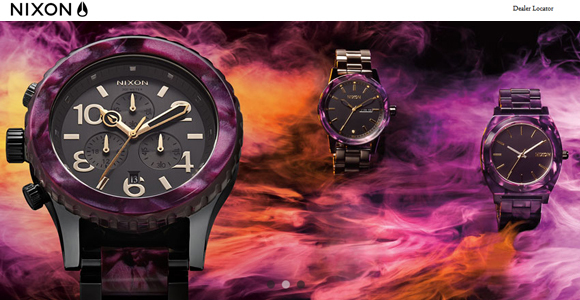 The design focuses for easy online shopping and can easily appeal to a mother’s eye. Kid’s toys had also developed a more responsive style of presentation. The latest feature update about this responsive design is its three new footer designs. Well-thought of and specially designed, Nixon was already one of the few brands to implement a responsive website which is perfectly created. The layout is simple and classic, yet works very well especially when viewed on a smaller screen like mobile phones. The designer had perfectly and properly represented each icon for a better understanding of each function. 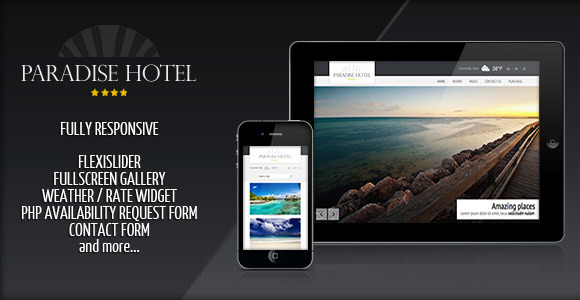 Paradise hotel is presented by an html5/CSS3 template which is perfect for restaurants, spa and other similar establishments. It has been uniquely defined and the layout is simple yet very classic when viewed. Also works best in laptops and mobile gadgets with an easy navigation too. 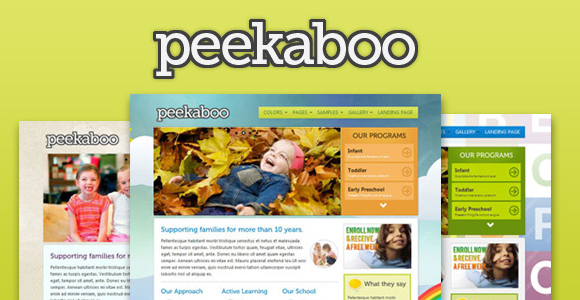 Peekaboo was created with HTML/CSS template and presents a theme especially for children. The design was geared for daycare, preschool and other related business and can be viewed with relatively few designs and backgrounds. It is featured with a jQuery grid carousel system, Colorbox lightbox plugin and a Nivo slider. Travel is created using a very modern and fashionable template which is designed for the specific needs of various travel agencies. 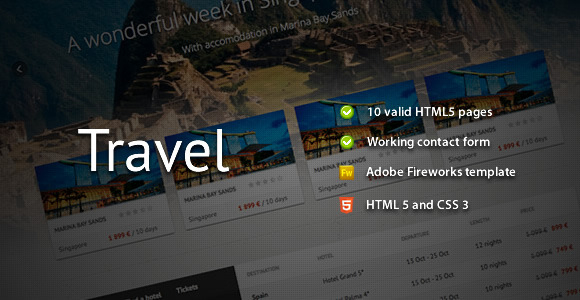 It comes with 10 HTML5 templates, sliders, animations, Adobe Firework template and different page templates. This offers a more responsive design which uses a simple yet defined layout with well crafted images. The navigations are simplified for a better understanding, and can easily function with all other icons. Mobile users can well identify the products even in the smaller screens. The web design is highly lightweight and responsive although one can use images on its web page. 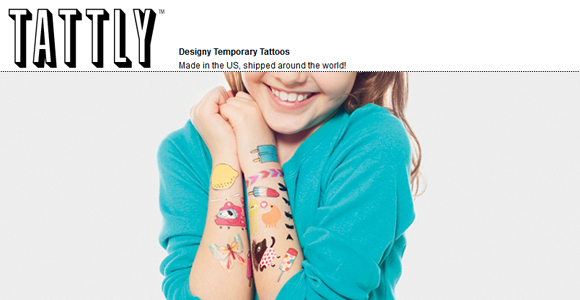 This responsive store uses a design which was appropriately created by talented designers and illustrators. It uses a simple colorful background and simple grid structures for easy navigation. The layout is very appealing and flexible, that it can adjust accordingly to any screen size when viewed. It is easy to navigate through the product list with a corresponding price readily displayed with each product that you view. 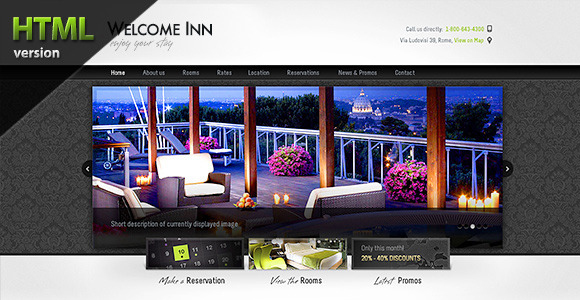 Welcome Inn is a hotel HTML template, which provides a very clear and modified clean design. The design was created with a very clear and clean concept, which can perfectly meet the qualifications of a hotel, mountain lodge or any other travel agencies and even blog sites. It is uniquely presented with a simple classy style that is very attractive. The navigations are also conveniently presented for easy viewing pleasure. It is also supported by packages of 8 Photoshop files and XHTML files. 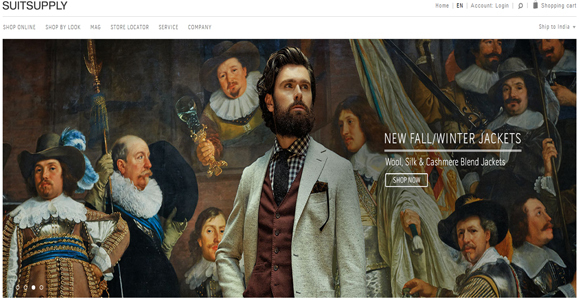 This is a very fine and unique eCommerce html template presented in distinct appealing colors, very neatly made layout. 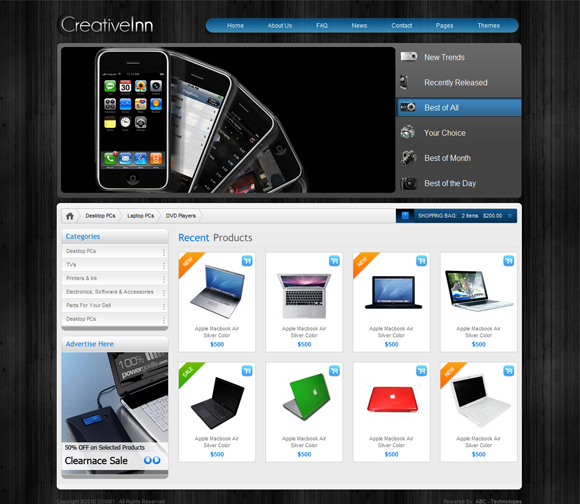 It has full features and provides more attractive layouts necessary for particular stores online. Enjoy using its 34 HTML pages available to your own liking and its jQuery sliders and carousels with different layouts available. It also comes with customizable form elements and other options to display your product listing and pricing. This shopping store is presented with a very modern and fashionable template that is uniquely presented for any viewer. The various pages are available, and all necessary items are included for easy navigation access. You can create different and separate pages for your home page, product listings, shopping cart, contact form and FAQ.